Ductless Mini Split * No trip charge for any repair over $150! Call for heating experts today. Ductless mini split cooling systems are often installed in residential or commercial settings when tying into ductwork is not practical, or if ductwork does not exist. Mini splits are appreciated by many due to their flexibility and small size. They are quick to install and individual indoor units can be installed in separate rooms - all connected to one outdoor unit. Separate thermostats provide cost savings, allowing users to only air condition rooms in which they will be in. Avoiding ductwork is seen as nothing but positive for some homeowners, as ducts are often associated with wasted energy with forced air systems - especially if ductwork runs through rarely used areas of a home such as a basement or an attic. It is often hard to find a qualified installer for mini splits, but here at Global Heating & Cooling our experienced staff can get your mini split installation completed in a prompt, professional, and courteous manner! Whether you need just one indoor unit or one unit for each room of your five-bedroom house, we guarantee that you will love your new ductless mini split cooling system. In addition to new installations, Global Heating & Cooling also repairs and services existing mini split systems. We currently are offering a promotion for repairs and will wave our trip charge on any service that costs $150 or more. 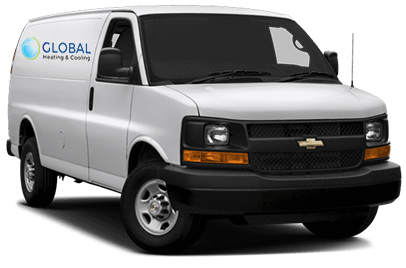 Call (773) 801-3734 to speak to one of our heating and cooling experts!